It was our first trip down to Pau and it was certainly a very long way! I was riding BAYANO in the CCI**** and we left Sunday evening in preparation for the long drive with the trot-up the following Thursday. Barney flew through the trot up looking incredible thanks to Charlotte’a amazing plaiting and turn-out skills. I had a late draw with my dressage on Friday afternoon. Barney worked in incredibly well thanks to much hard work from my amazing dressage trainer Andrew Fletcher who has worked tirelessly for another season to help us as much as he can. I was also very lucky to have some last minute help from Dickie Waygood. Barney overall was excellent in his test and felt much forward thinking. 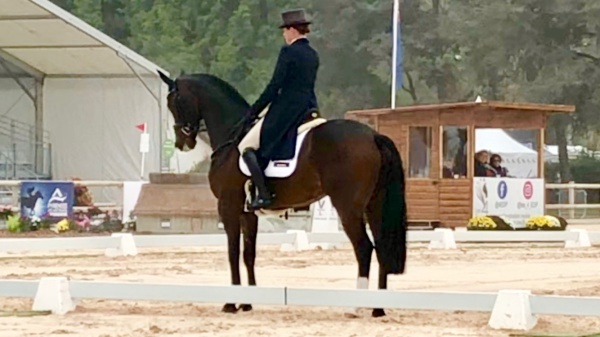 I had a few small mistakes in the walk and in one of his changes but otherwise I was very pleased especially with all three of his halts and the stretching canter where he scored 8.5’s. He scored 27.5 and went into 6th place from over 60 starters going in to the XC. Dickie and I walked the XC together and it was certainly a very tough track with testing combinations starting approx minute 2 and continuing right the way though the course. It was twisty, very big in places and the time was certainly not going to be all that easy to achieve. We made some solid plans and I was feeling confident about the round ahead. Barney warmed up brilliantly giving me a great feel and was certainly up for the challenge. We were very quick for the first few minutes and despite a couple of sticky moments at the 1st water we stayed on time and having a cracking round. Just after the third water there was a huge open ditch with a white gate behind it and a bright white ground line. I was on a good forward distance but unfortunately Barney read the ground line as a placing pole and jumped it and put down on the undefined ditch thinking it was more of an exercise rather than a complete jump. He hit the gate with his chest and I was thrown over his head and onto the ground the other the side – resulting in elimination. Thankfully both Barney and I are absolutely fine and no worse for wear, just very fed up to come to such an abrupt halt during what was proving to be a very successful competition. But thats the sport sometimes and whilst very frustrated I am grateful to have such an incredible, brave and resilient horse who will come out better and stronger than ever in 2019. A huge thank you to Barney’s owners for allowing me the opportunity to compete such special horse and everyone who helped make our long trip possible.